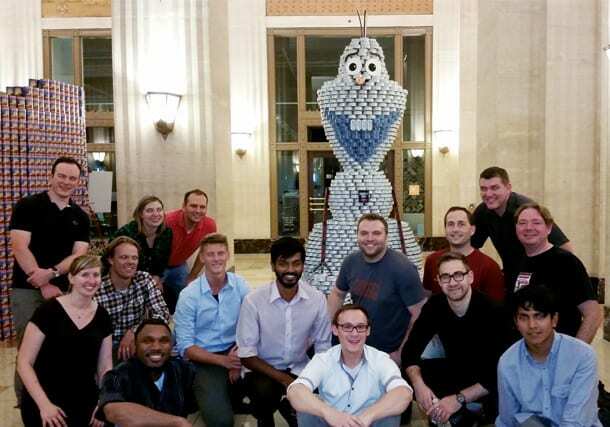 The team of Booth Hansen + Forefront Structural Engineers has won the award for “Best Meal” at the 2014 CANstruction Chicago Competition! This event, which teams up Chicago’s architecture, engineering, and construction companies benefits the Greater Chicago Food Depository. The BH + FSE entry — entitled, “Do You Want to Feed the Hungry?” — featured the animated snowman “Olaf” from Disney’s “Frozen”. The 9 foot tall structure was constructed using 13,178 tuna cans, pasta boxes, and water bottles. A few Toblerones, Milky Ways, Pringles cans, and Slim Jims were also used. The “Best Meal” award is a nationally recognized award, so Olaf will now go on to compete against other “Best Meal” can structures from across the country. To see how Olaf was constructed, visit our YouTube page.